Don’t mind me. I listen to records like drinking a fine wine … slow, methodical, and savoring multiple plays in order to experience the entire album. Many times, it takes the third spin when the music finally comes together and my soul is touched with its brilliance. A beautiful bridge, solo, lyric or fill comes to the forefront of my consciousness that maybe I missed previously. The radio single which initially grabs your attention opens the door to the slow burner that really seals the deal to make you fall in love with the artist’s entire performance etched into vinyl or burned onto a compact disc. As my next chapter of liner notes is about to unfold, know that there is a reason for my madness. Although Cleveland is not part of the itinerary, this week I will touch on two new releases from three legendary performers that are touring the country together. 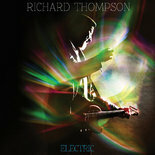 Richard Thompson has released a phenomenal album titled Electric that will have old fans buzzing and new fans discovering this legendary singer/guitar slinger. 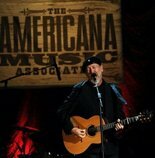 I was lucky to have a seat at the intimate Station Inn during one of the Americana Music Association showcases last fall where Thompson mesmerized the crowd with a solo performance of old and newly recorded songs. In the audience was the great Buddy Miller and it was very peculiar that he was not there to play, but to be a spectator. Little did we know that Miller was not only going to produce Thompson’s new record, but that it was being recorded at Buddy’s home studio in Nashville. A little power trio was formed with longtime touring drummer Michael Jerome and session veteran Taras Prodaniuk on bass and mandocello. Electric is packed with several catchy radio singles that ranks right up there with his vintage 2007 record Sweet Warrior. From the opening rocking track “Stoney Ground”, many of the eleven tracks will end up in your smartphone’s personal jukebox. But Thompson mixes things up well as the album flows through folk songs like “Salford Sunday” and “Saving The Good Stuff For You” with female vocal harmonies provided by Siobham Maher Kennedy and fiddle provided by Stuart Duncan on the later track. A gritty blues number “Sally B” along with the jangly guitar driving “Good Things Happen To You” is mixed with ballads “My Enemy” and “The Snow Goose” which includes the lovely voice of Allison Krauss. Two of the highlights come from the big ballad “Another Small Thing In Her Favour” which includes a nice soft electric solo and “Straight and Narrow” with a little Farfisa sounding organ thrown in for good measure. Along with Dennis Crouch playing bass, Buddy Miller adds rhythm guitar to tracks on the New West Records label and marketed by Sacks and Co. So if Thompson is the opener, who would be able to follow that on stage, you may ask? 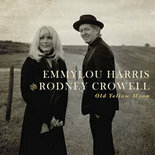 Well, it took about thirty-eight years for Emmylou Harris and Rodney Crowell to record a duet album, so this special pairing is the unique highlight receiving top billing. Again, longtime witnesses of this man and woman will not be disappointed as Old Yellow Moon incorporates something old, something new, something borrowed, and something blue. The record was produced by Brian Ahern who was behind the boards of both Emmylou’s 1975 Pieces of the Sky and Crowell’s 1978 Ain’t Living Long Like This debut albums. 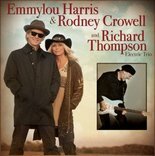 Crowell started his career being the rhythm guitarist and vocal partner to Harris in what was known as the legendary Hot Band which included James Burton (lead guitar), Glen Hardin (piano), John Ware(drums), Hank DeVito (pedal steel), and Emory Gordy Jr. (bass). Although the band reunites, with the exception of DeVito, to play on a select number of the record’s twelve tracks, most of the backing band consists of Billy Payne (keyboards), Marco Giovani (drums), Dave Hungate (bass), and Ahern on guitar. The album kicks off with the upbeat “Hanging Up My Heart” featuring guest harmony vocals by Vince Gill. It was written by DeVito for Sissy Spacek’s lone country album after her starring success as the lead in Coal Miners Daughter. The spirited “Bluebird Wine” recorded by Harris on her first Lp has been updated by songwriter Crowell as the first two verses were rewritten. “You know, the writer’s best friend is revision” said Crowell. “I wrote that when I was 21 or 22 so now it’s a little more in keeping with my sensibilities”. Another beautiful number penned by Crowell is “Here We Are” that Harris sang as a duet with George Jones in 1979. “Chase The Feeling” written by Kris Kristofferson was a new interpretation by the pair along with the classic “Dreaming My Dreams” made famous by Waylon Jennings that was a late add to the project. Other highlights on the Nonesuch label and Sacks and Co. promoted release are a cover of “Back When We Were Beautiful” by Matraca Berg and “Invitation to the Blues” by Roger Miller. The more I listen to Old Yellow Moon, the more I keep falling in love with the remaining tracks. So snap this baby up when it hits record stores later this month. Folks lay out their hard earned money for new records and the one’s that only have a catchy tune with lots of filler become disappointments. These CD’s aren’t even considered “pre-loved” and soon are either collecting dust or traded in. Eventually, some of these music lovers become so disenchanted with the product that they’re a casualty of the lost listening audience. So it’s my mission to remind readers that there are still exceptional artists and masterpieces being created. You just need to be pointed in the right direction … for I am just a simple messenger to help you find that musical ecstasy. Next week, we’ll explore some new artists … thanks for taking the time and I’m always humbled to have you join me on the journey.